Image Size: 34 X 32 in. Image Size: 22 X 24 in. 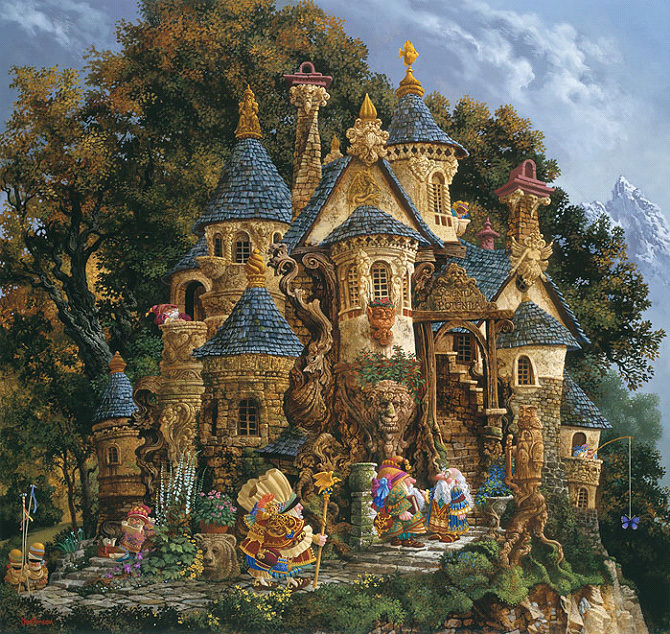 For only a short window of time, one of James Christensen’s most beloved paintings is available as a Giclée Canvas Anniversary Edition! You’ll have to place your order quickly because enrollment in "The College of Magical Knowledge" ends September 30, 2011. "The College of Magical Knowledge" will only be offered as a personal commission through September 30, 2011. It comes in two different sizes. First, a magnificent MasterWork™ canvas at 34" w x 32" h. This MasterWork Edition will not exceed 35 pieces regardless of the number of orders received. The regular Fine Art Canvas at 22"w x 24"h will have an edition size set by the number of orders we receive by the September 30 deadline. For the first time, you will have the option of ordering your Greenwich Workshop Fine Art Canvas Edition (either size) in a gallery-wrap format, which makes it suitable for display without the need for additional framing! There is an additional charge of $30 for this service.